Gainsborough Gardens is a private communal garden at the centre of a gated enclave of housing built in the late C19th on the former site of Hampstead Wells spa. In 1698 6 acres of swampy ground that contained chalybeate water were donated to the 'poor of Hampstead' by the then Lords of the Manor, the Gainsborough family. Hampstead Wells was a popular spa in the early C18th and contributed to the area's development as a fashionable place of residence. The houses and communal garden were laid out by the Wells and Campden Charity from the 1880s, covering part of the former pleasure grounds where a bowling green and ornamental pond had been, the site of the latter visible in the lawn. Today the lawns are surrounded by shrubberies with a wide variety of plants and mature trees. A path runs round the edge with a number of small pergolas marking entrances to the gardens. 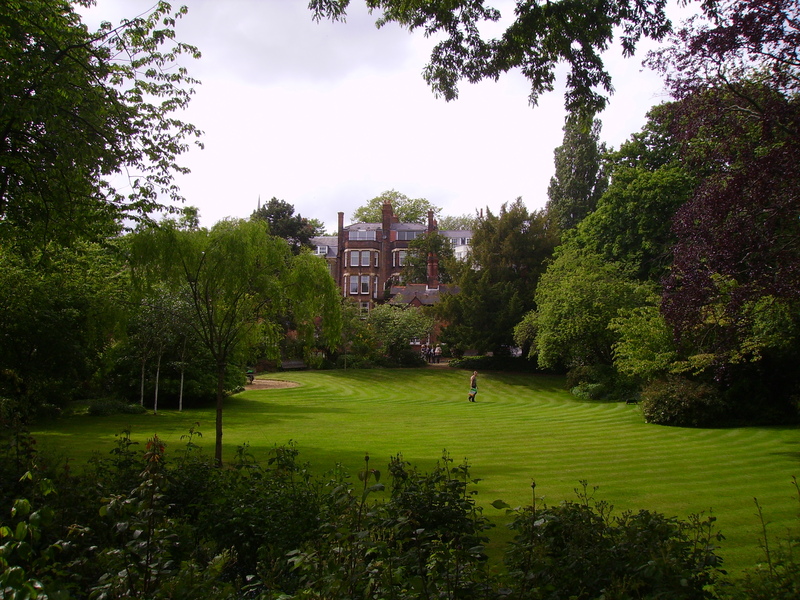 Gainsborough Gardens is an oval garden enclosure with mature trees and luxuriant planting at the centre of a gated enclave of private housing built in the late C19th on the former site of Hampstead Wells spa and once part of Hampstead Heath (q.v.). In 1698 6 acres of swampy ground, found in the late C17th to contain chalybeate water with medicinal properties, were donated by the then Lords of the Manor of Hampstead, the Gainsborough family, hence the name of the gardens. A granite panel by the Chalybeate Well on Well Walk records the donation with the following inscription; 'To the memory of the Hon. Susannah Noel who with her son Baptist, 3rd Earl of Gainsborough gave this well together with 6 acres of land to the use and benefit of the poor of Hampstead, 20 December 1698. Drink traveller and with strength renewed / Let a kind thought be given / To her who has thy thirst subdued / Then tender thanks to heaven'. The Wells Trust was set up to administer this gift and the land was leased c.1700 to John Duffield who undertook to develop it as a Spa, building the Long Room comprising a Pump Room for drinking the chalybeate water and a larger Assembly Room for entertainment. There were also pleasure grounds, which in the northern part had a bowling green and an ornamental pond with boathouse, its position still visible in the centre of the lawn of the gardens. There are remains of an ice house in the shrubbery that is presumed to date from the heyday of the spa. The southern part of the former pleasure ground is now covered by the garden of 46 Well Walk. Hampstead Wells, which in addition to its waters provided dances, concerts, cards and other diversions, soon became popular with Londoners and contributed to the development of the area as a fashionable place of residence. However by as early as 1709 the spa was attracting a less genteel crowd, much to the consternation of local Hampstead residents, and as a result Duffield's lease was not renewed in 1721. The former spa buildings were converted to other uses, the Long Room becoming a chapel-of-ease to the parish church until 1852, then an evangelical chapel and finally used as a Drill Hall for Hampstead Volunteers before being demolished in 1882. There were attempts to revive the spa in the 1730s and new spa buildings were built further along Well Walk. In 1880 the Wells and Campden Charity was established when the Wells Trust merged with the Campden Charity, which had been set up in 1643 by Lord Campden, whose family owned the Manor from 1620. Later, in 1971, the charity amalgamated with a number of other charities to become the Hampstead Wells and Campden Trust, and continues to support people in Hampstead and the local borough. The enclave of houses and its communal garden that form Gainsborough Gardens were developed by the Charity in the 1880s. The overall plan was that of architect Henry Legg, who also designed many of the houses, including Nos. 6 - 8 and the Gardener's Lodge of 1886 at the entrance on Well Walk. This was formerly the residence of the gardener for the central gardens, now private housing. Nos. 3 and 4 were built in 1884 as a pair of semi-detached houses for a London tailor, Mr Timewell, who lived in No. 4 and let No. 3. The designs by E J May for these Queen Anne style houses were exhibited at the Royal Academy in 1884, and May did much work for the Bedford Park Estate (q.v.). Nos. 11 - 14 were built in the early 1890s, designed by Horace Field. Opposite the northern entrance to Gainsborough Gardens on Well Walk is the Chalybeate Well and drinking fountain erected here in 1882, designed by Legg. The Charity had initially planned to construct a road here but this was successfully opposed; a subsequent petition to use the site for 'aged, infirm and poor artists and literary men' came to nothing. A number of mature trees in the gardens predate the housing, including a Turkey oak; a horse chestnut estimated to be c.300 years old was only removed in the early C21st as it was dangerous. In its place a sapling from the same tree was planted, which had been grown by one of the residents. The gardens, owned and maintained by the Trustees of the Wells and Campden Charity, were described in 1928 as 'an oval-shaped enclosure, very attractively laid out as an ornamental garden with trees, flowering shrubs, etc. A great amenity to the dwelling-houses overlooking it'. In the 1930s J B Priestley, who then lived at No 27 Wells Passage, is said to have played tennis in the gardens. Today the lawns are surrounded by shrubberies with a wide variety of plants including azalea, rhododendron, hydrangeas, and roses. A path runs round the edge with a number of small pergolas marking entrances to the gardens.